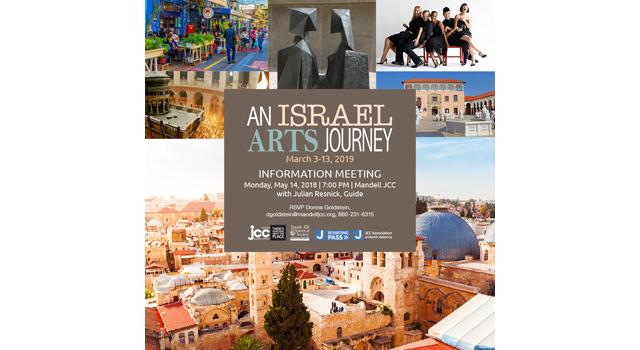 On Monday, May 14, 7 p.m. the Jewish Historical Society of Greater Hartford and the Mandell JCC will co-host an information meeting regarding the 10-day Israel Arts Journey they are planning to Israel in 2019. The meeting will be held at the Mandell JCC, 335 Bloomfield Ave. in West Hartford, and will feature a talk by the trip’s guide, Julian Resnick. The trip, which will be held March 3 – 13, will present a picture of Israel, past and present, through the lens of the country’s diverse arts and culture. RSVP to Donna Goldstein at dgoldstein@mandelljcc.org, (860) 231-6316.